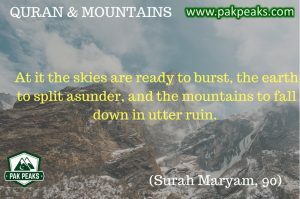 There are about sixty different verses in the Holy Quran which refer to Mountains or Peaks in different contexts.Upon a closer study five common themes are revealed under which mountains have been quoted, referenced or discussed. 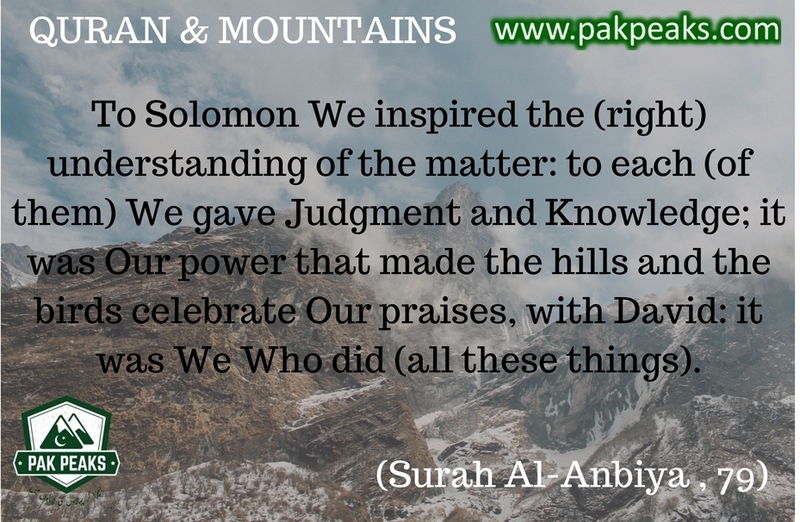 There are at least ten verses in Holy Quran in which mountains have been quoted with reference to specific Prophets. This includes Prophet Ibrahim (far distance of hills to bring back birds from there), Prophet Noah (for height of mountains to save from flood), Prophet Daud (with relation to skill and empowerment), Prophet Suleiman (praise and empowerment ), Prophet Moses and in case of (Jesus and Mary) mountains / high ground have been used with reference to their security and well-being. 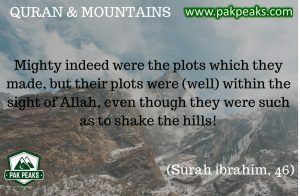 In ten different verses of Holy Quran mountains has been referred as symbols of power and magnanimity of their creator. 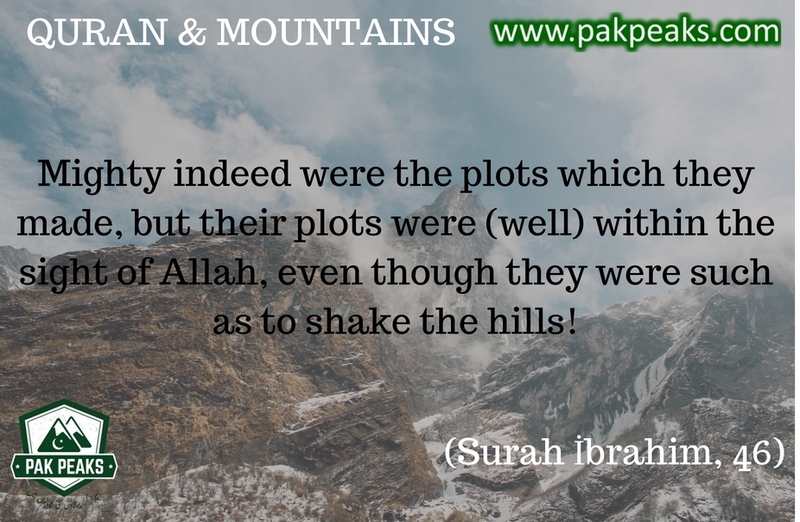 There are twelve verses hinting and elaborating towards the benefits or the usefulness of the mountains. This includes the biological / environmental benefits of mountains as habitat for natural life (bees) and more importantly as key geological structures standing fixed and firmed and holding the earth in place (like pegs). There are six verses about people specifically and mankind in general. This includes reference of previous people who were highly skilled in carving out mountains etc. 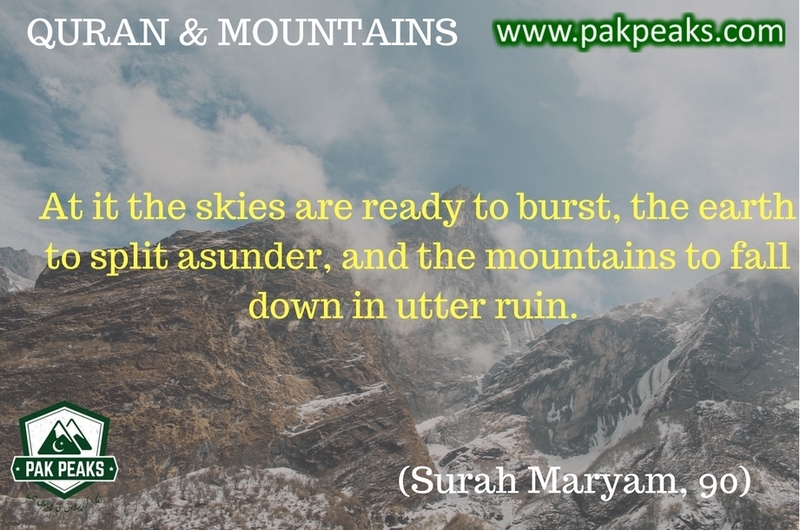 Most elaborate mention of mountains in Holy Quran has been referred in nineteen different verses about resurrection and Qayamah. These verses describe the scattering of mountains like dust and wool and their disintegration in final hours. Each of these themes are elaborated below. Behold! Abraham said: “My Lord! Show me how Thou givest life to the dead.” He said: “Dost thou not then believe?” He said: “Yea! but to satisfy My own undertaking.” He said: “Take four birds; Tame them to turn to thee; put a portion of them on every hill and call to them: They will come to thee (Flying) with speed. Then know that Allah is Exalted in Power, Wise. Then followed he (another) way, Until, when he reached (a tract) between two mountains, he found, beneath them, a people who scarcely understood a word. When Moses came to the place appointed by Us, and his Lord addressed him, He said: “O my Lord! show (Thyself) to me, that I may look upon thee.” Allah said: “By no means canst thou see Me (direct); But look upon the mount; if it abide in its place, then shalt thou see Me.” When his Lord manifested His glory on the Mount, He made it as dust. And Moses fell down in a swoon. When he recovered his senses he said: “Glory be to Thee! to Thee I turn in repentance, and I am the first to believe. If there were a Qur’an with which mountains were moved, or the earth were cloven asunder, or the dead were made to speak, (this would be the one!) But, truly, the command is with Allah in all things! Do not the Believers know, that, had Allah (so) willed, He could have guided all mankind (to the right)? But the Unbelievers,- never will disaster cease to seize them for their (ill) deeds, or to settle close to their homes, until the promise of Allah come to pass, for, verily, Allah will not fail in His promise. Seest thou not that Allah makes the clouds move gently, then joins them together, then makes them into a heap? – then wilt thou see rain issue forth from their midst. And He sends down from the sky mountain masses (of clouds) wherein is hail: He strikes therewith whom He pleases and He turns it away from whom He pleases, the vivid flash of His lightning well-nigh blinds the sight. Had We sent down this Qur’an on a mountain, verily, thou wouldst have seen it humble itself and cleave asunder for fear of Allah. Such are the similitudes which We propound to men, that they may reflect. “And ye carve houses out of (rocky) mountains with great skill. (It is) a Day whereon men will be like moths scattered about, And the mountains will be like carded wool. When the earth shall be shaken to its depths And the mountains shall be crumbled to atoms. The Day that the sky will be like molten brass and the mountains will be like wool. The Day that the Trumpet shall be sounded, and ye shall come forth in crowds; And the heavens shall be opened as if there were doors, And the mountains shall vanish, as if they were a mirage. On the Day when the firmament will be in dreadful commotion. And the mountains will fly hither and thither. 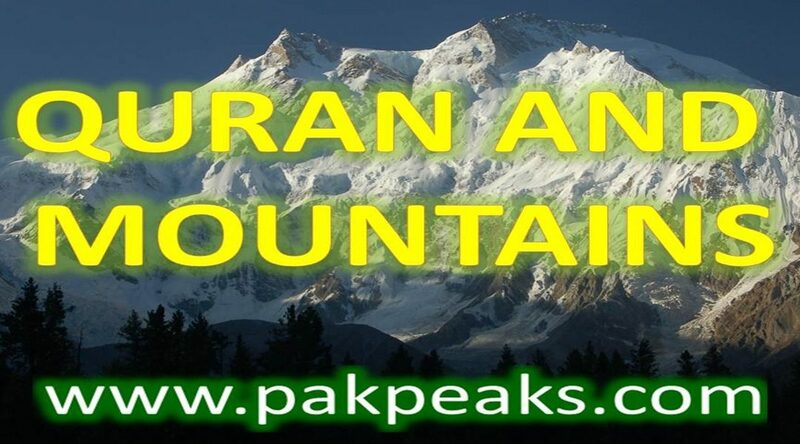 The context of the word ” mountain” in Holy Quran thus varies . Sometimes it is used as proof of magnanimity of creator, other times it is linked with the end of times and some times mountains are used as power and symbol of greatness. However one thing needs to be kept in mind, these verses are not for geographical or informational purpose alone. Like remaining Holy Quran they are for the guidance and reflection of mankind. 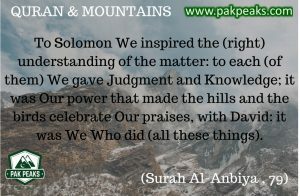 A common theme from this subject is to add and look study mountains and ponder upon their creation, purpose, demise and hence strengthen our relation with Allah. P.S : Author is not an expert in Quranic Studies and hence any corrections if required will be welcomed.